For the month of August 2007, I’ll donate one third of the funds that I receive from the Amazon Honor System to Freakonomics so that they can afford to purchase stock photography. My donation to Freakonomics comes with a catch. Freakonomics will have to apologize on its blog for its past bad blogging practices. I’ll donate another third to Hammond Community Library in Wisconsin, one of the victims of the Freakonomics copyjacking (bad hotlinking). The suggested donation is $27.95, the list price for the Freakonomics book. Minimum donation is $1.00. I would like to publicly apologize to Freakonomics. If my constant blogging about the bad blogging practices of Freakonomics has embarrassed anyone associated with Freakonomics, then I sincerely apologize. As I have repeatedly stated, Freakonomics has a larger platform on the Internet than I do. The Freakonomics blog has a Technorati authority score of 1674, whereas erikjheels.com has an authority score of 147. But with authority comes responsibility (or so I was taught in the Air Force). And having committed some copyright faux pas (faux pases? ), Freakonomics has the responsibility, I believe, to further the conversation and educate others about the evils of copyright infringement and copyjacking. But since Freakonomics has exercised its right to remain silent, I’ll have to blog harder (about 11.204081 times harder, to be more precise) to get the message out. Freakonomics is a book about economics. Copyright infringement and copyjacking are economic issues. Freakonomics has a lawyer editor. Copyright infringement and copyjacking are legal issues. The Freakonomics blog is a commercial blog that helps boost sales of the Freakonomics book. 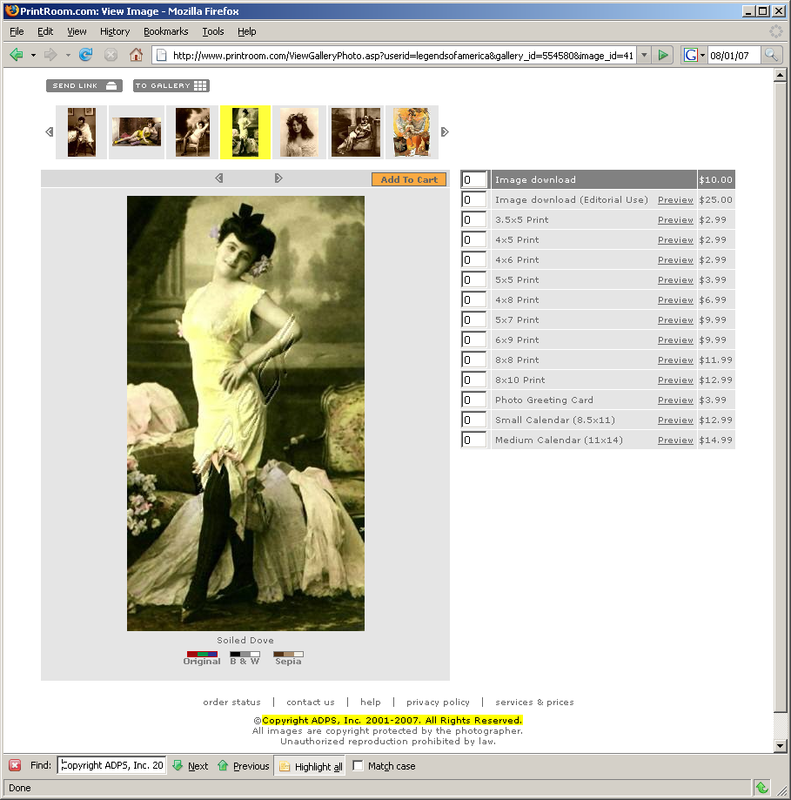 Freakonomics copyjacked an image from a public library. Freakonomics blogs about people ripping them off. Freakonomics has been silent about its own transgressions. 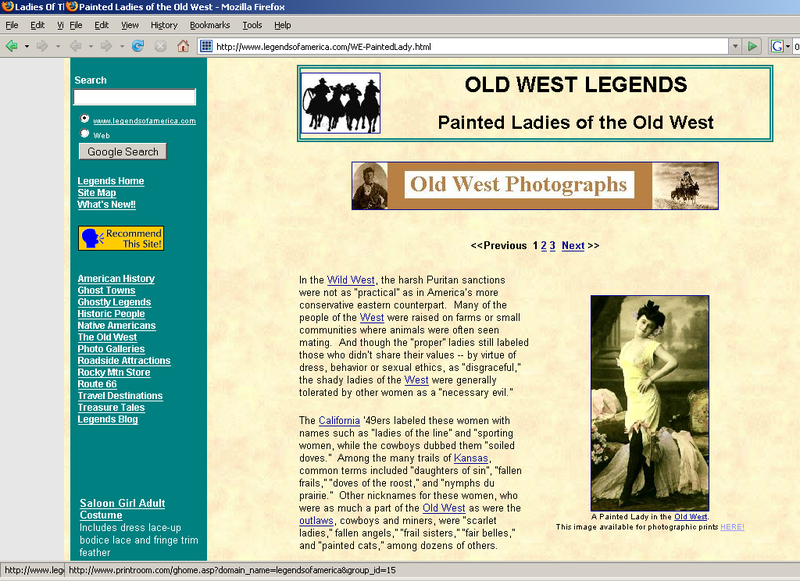 Today, Freakonomics blogged about the oldest profession and included an image called paintedlady.jpg. I searched on iStockphoto.com but did not find the photo. I searched Google images and did find the “painted lady” image. The Google Images search page pointed to Rambling Bob. Rambling Bob links the image to its source on Legends of America. The Legends of America page includes a link for purchasing prints of the painted lady. The link goes to the Printroom.com store. In the Printroom.com store, I found the image in question (entitled “Soiled Dove“) with details about how to purchase print and electronic copies. Plus a copyright notice saying that all rights are reserved. 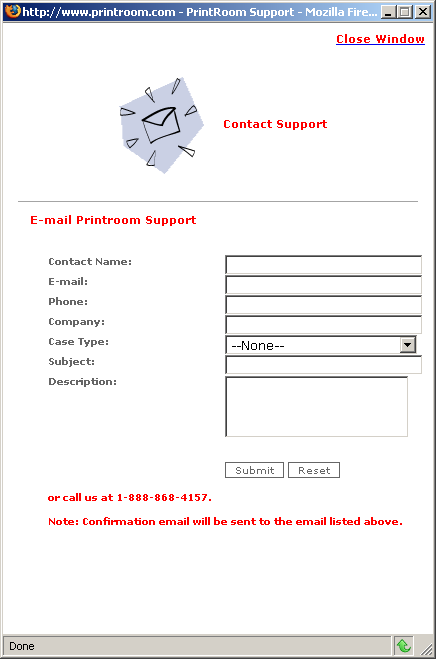 There is also a contact form with Printroom.com’s phone number. Kathy also added that she takes old images like these that are in the public domain, improves them by touching them up by hand, and sells them in her store. The original work is in the public domain. Kathy’s new and improved work is not. So Kathy, like Freakonomics, makes her living off of selling copyrighted works. You can add that one to the irony scorecard. I just don’t get this. Stock photography at iStockPhoto, which I use on some of my blogs, is around $1 per image (less if you buy in quantity). Plus there is so much free clip art out there, either to scan or download. For a big site like Freakanomics to steal photos is ridiculous. Why not just switch to CC-licensed photos from Flickr or similar sites? I think that the only thing that could be more ironic would be if I started infringing copyright.